This proved to be a great day for celebration as club captain Jonathan Wright led the 1st X1 to a magnificent home win against Harborne on his birthday! The day started well for him, winning the toss (yet again) and inviting the visitors to bat first on a good track. Ted Baylis got things underway with the removal of Bailey (3) before Wood (63) and Lloyd (87) put together a useful stand of 103 runs. Controversy marred this period of the game when Tom Sherriff removed the bails when Lloyd was out of his ground appealing for a run out claiming the ball was still in play. The umpires conferred and Lloyd was then given out but refused to go claiming the ball was dead - confusion reigned for a while until the umpire recinded his decision and Lloyd was re-instated. There was a rumour amongst the spectators that Jonathan Wright had called the batsman back out of a sense of decency and fair play! It may have been his birthday but this was not the case, he was merely asking for clarification of the umpires decision! The game finally got under way but the effect of this disruption clearly affected some of the home players concentration and for a while KVCC were struggling in the field. Captain Wright led by example in an effort to keep the team focused and concentrate on the matter in hand. 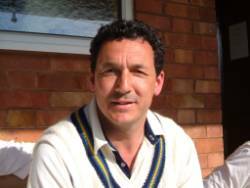 During this difficult period the visitors took the game away from the home side until Nigel Davenpot took two wickets in two balls (Wood and Cockcroft). Harborne were now 115 for 3 with KVCC back in the game. However, another partnership between Lloyd and Moreton took the game away from the home side yet again with Moreton playing a gem of an innings scoring 100 not out. KVCC worked hard in the field to produce two run outs (ironically including the wicket of Lloyd) but the visitors amassed a total of 275 for 5 after their allotted 55 overs. A tough ask in anyone's language! Mark Mansell and Jonathan Wright set about the task in a timely fashion, intent on setting a solid base for later batsmen to follow. Mansell (5) was unlucky to get out when he was caught by Jordan taking a diving catch at mid wicket. This bought the in form Divan Van Wyk to the crease and with his captain set about a planned assault on the visitors bowling. Wright began cautiously and only hit two sixes in his first 50! after that the supporters were treated to some real power hitting as he gradually took the game away from Harborne. The birthday boy began a bash of his own with 9 sixes and 10 fours in a magnificent knock of 146 runs. He and Van Wyk (87) put on a thrilling stand of 210 runs before Wright was eventually run out for what some unkind supporters suggested was an act of 'jug avoidance'. The game was still not won as Van Wyk stepped up the momentum only to be caught going for an expansive hit. Suddenly, shades of Water Orton the previous week came to mind as both Lloyd (0) and Davenport (4) perished trying to hit the ball out of the ground when singles were the order of the day. This set back put a great deal of pressure on Andy Siwicki who arrived at the crease with the score at 266 for 5 and just two overs to go! When Davenport was bowled it was 267 for 6 and one over to go! Siwicki then reminded us that youth and impetuous will always come out on top as he hit the first ball of the last over for 6 to bring the crowd to their feet. He then finished the game hitting the winning runs with just 2 balls to go. What a finish! What a birthday! What a day.